Here are we comes with the best custom ROMs for Google Pixel 3 smartphone. The Google Pixel 3 was launched in October 2018 with Android 9.0 Pie OS. So if you are the owner of this great phone and wish to flash the best custom ROMs for Google Pixel 3. In this blog, we will let you know how you can download and install the best custom ROMs for Google Pixel 3. Every Android smartphone comes with a preinstalled operating system known as Stock firmware on your device. The official stock firmware is good but it is limited by the phone’s manufacturer. So if you are the advanced users and want some advanced features that are not possible in the stock firmware. Then the best choice to install any custom ROM on your device. The one of the good thing in Android OS that it is open source OS and it is allowed to develop and Customize ROM for their phone. The custom ROM gives you the opportunity to explore new designs, UIs and enjoy new and impressive functions. Also, it gives you lots of customizations options, better battery timing, your phone performance enhanced and much more. By following given below detailed guide you can easily and quickly install best custom ROMs for Google Pixel 3. The custom ROM is developed by the third-party developer and it is based on official Android source codes. 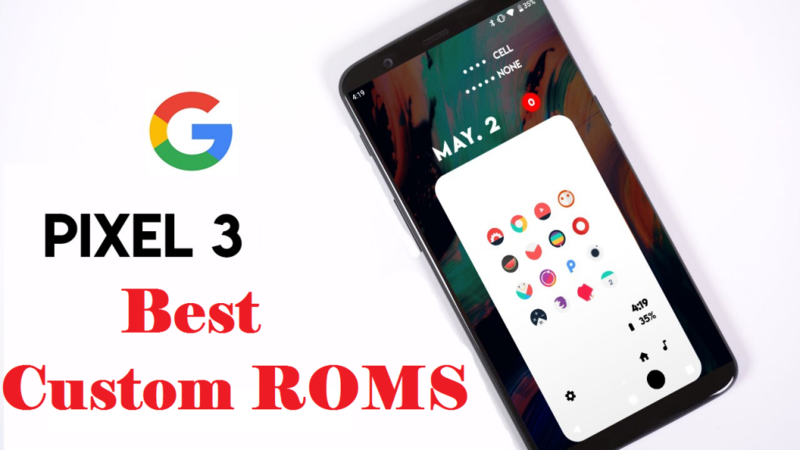 Given below we share the list of best custom ROMS for Google Pixel 3. You can download from there and install it on your device and enjoy the lots of customizations and some aftermarket features. In order to install any custom ROM on your Google Pixel 3, your device should be unlocked bootloader and must install the latest TWRP custom recovery on your phone. While installing custom ROM your entire data will be wiped clean, so we are highly recommended you to take the full backup of all your important data before proceeding. If you are interested in installing the best custom ROMS for Google Pixel 3, then go ahead and follow the given steps. First of all, back up all the existing data on Google Pixel 3 like contacts, gallery, SMS, and apps data, then go ahead. Make sure that Google Pixel 3 has sufficient battery charge before starting the process. Now connect Google Pixel 3 to PC and copy both the zip files in the home directory of the device’s external storage. After copying, unplug and turn off Google Pixel 3 completely. Now boot Google Pixel 3 in recovery mode, press and hold “Vol Down+ Power” Buttons for a couple of seconds. In results, the process downloads and install best custom ROMS for Google Pixel 3 got successful.